While many breeds of guinea pigs have smooth, silky hair, other breeds look as though they are suffering perpetual bad hair days. Certain guinea pigs appear to have cowlicks, either on top of their heads or all over their bodies. These hair formations, called rosettes, are natural; they distinguish particular guinea pig breeds. Abyssinian guinea pigs are easy to identify by their chaotic hairstyles. Abyssinians have series of rosettes all over their bodies, creating patterns of ridges and whorls in their short to medium-length fur. The breed standard requires one or two rosettes on each shoulder, four across the back, and four across the rump, all arranged symmetrically. However, many Abyssinians you may find in rescues or shelters have less orderly arrangement of rosettes and will have uneven hairstyles. In Australia, the Sheba breed combines the long hair of a Peruvian or Silkie pig with the rosettes of an Abyssinian to create a truly wild-haired pig. Another variety of guinea pig wears a single rosette at the top of the head. A “crested” pig may have smooth fur like an American guinea pig or may be more wooly like a Teddy or Rex, but the rosette always appears on the head or forehead of the animal. Long-haired guinea pigs with crests are coronets, rarer than their short-haired cousins. Owning a guinea pig with rosettes has some challenges. 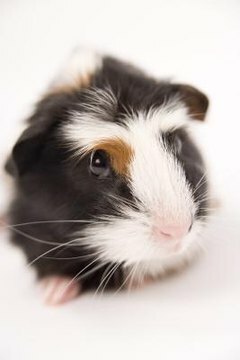 With a smooth-haired American guinea pig, petting and brushing the animal’s hair is easy and trouble-free. Rosettes pose a problem, however, since brushing the hair away from its direction of growth can cause a guinea pig some discomfort. This is especially problematic in Abyssinian pigs due to the coarseness of their fur and the sheer number of rosettes. When petting an Abyssinian pig, take your time and groom carefully to avoid hurting or aggravating your pet. If your guinea pig has rosettes, they can serve to warn you early of certain types of ailments. Mites cause thinning fur, and in many cases the hair loss starts in the centers of rosettes. If you can see your pig’s skin in the center of one of these whorls, the pet might have a mite infestation. The rosettes on crested pigs can also be valuable for diagnosing lice, since these parasites tend to gravitate towards a guinea pig’s head and face. Spotting small moving specks in a forehead rosette should prompt a trip to the vet for treatment. Fortunately, mites and lice are easy to treat in guinea pigs; once removed, they rarely recur.